1. Whisk all the dressing ingredients in a bowl. 2. Cover and keep it in the fridge until required. 3. In a bowl, mix the pasta with oil and cover. 4. Keep it in the fridge for 30 minutes. 5. Remove and add all the other ingredients. 6. Add enough dressing and mix well. 7. Cover and chill for 2 to 3 hours. Tip: If the salad is dry, add some more dressing before serving. Note: Add tomatoes and cucumber if desired. 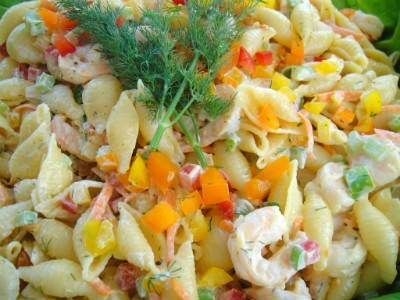 Feel free to comment or share your thoughts on this Shrimp and Pasta Salad Recipe from Awesome Cuisine.